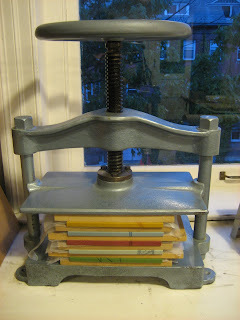 In 2010 I began a weekly commute to New York City as the Stein Family Scholar at The Center for Book Arts (the Center). Throughout my year at the Center I had the opportunity to take several workshops and classes. My two favorites were Barb Tetenbaum's Artist Book Strategies, Exploring Music and Musical Scores and Paul Moxon's Vandercook Maintenance Class. 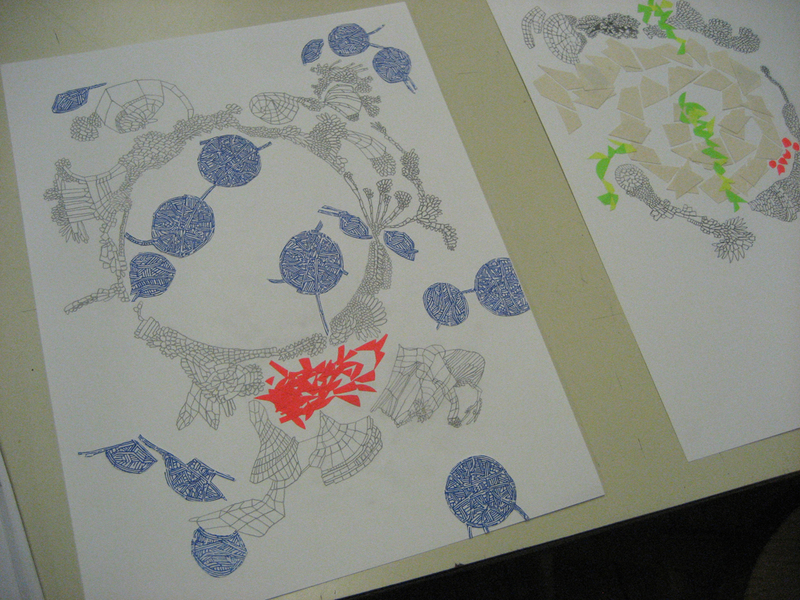 Two of my drawings from Barb Tetenbaum's workshop at the Center. In addition to taking workshops, I was given access to materials, the printshop, and the bindery in order to develop a book related project. The timing of this project coincided with the year that my daughter left home to attend her freshman year of college. It is the first time in my adult life that my responsibilities of parenting have dramatically shifted because my daughter has moved away from home. Her departure offers me (as a single parent) more freedom to take advantage of residencies away from home, like the one at the Center for Book Arts. In addition to this, it is also a year of great change for me as a parent--a turning point. I know, I know--using the emotions of an "empty nest" as content for artwork is absolutely dangerous. However, I feel I can express a particular point of view regarding parenting. I used my time at the Center for Book Arts to develop text and imagery that express this point of view. It has been an important time for me to investigate the telling of this story. Because my time at the Center was limited to one day a week and included a 4 hour commute round trip, I decided to work with these constraints: I wrote and sketched on the bus, directing my writings toward my memories of raising my daughter. As I began the editing process, I discovered that many of the memories were strongly linked to place. And over the years Helen and I have lived in many, many places. The books I made during the residency as the Stein Family Scholar are a collection of writings based on places we have lived, taken from the years 1995, 1999, 2001, 2007, and 2010. My inking station at the Center for Book Arts. 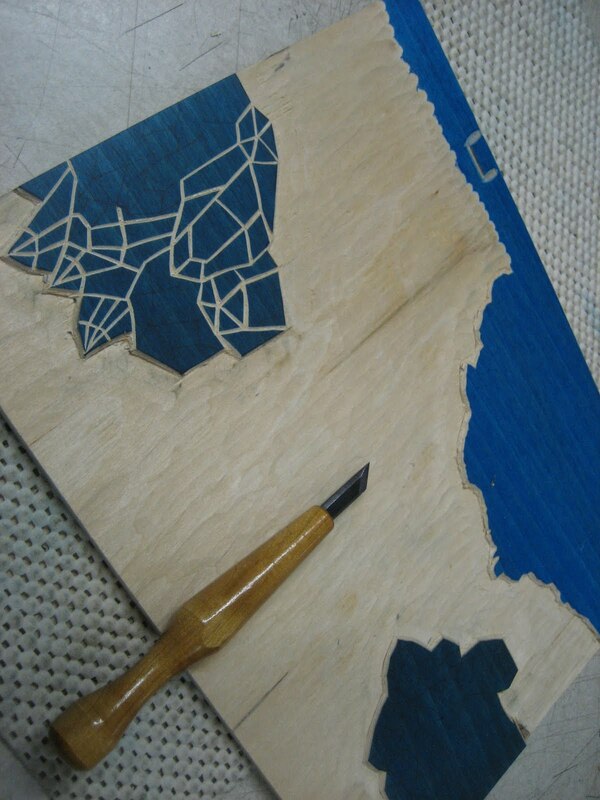 One of the reduction woodblocks used to print the imagery for "The World, 1995". I used a kento registration system, even though I printed with oil based inks on an etching press. 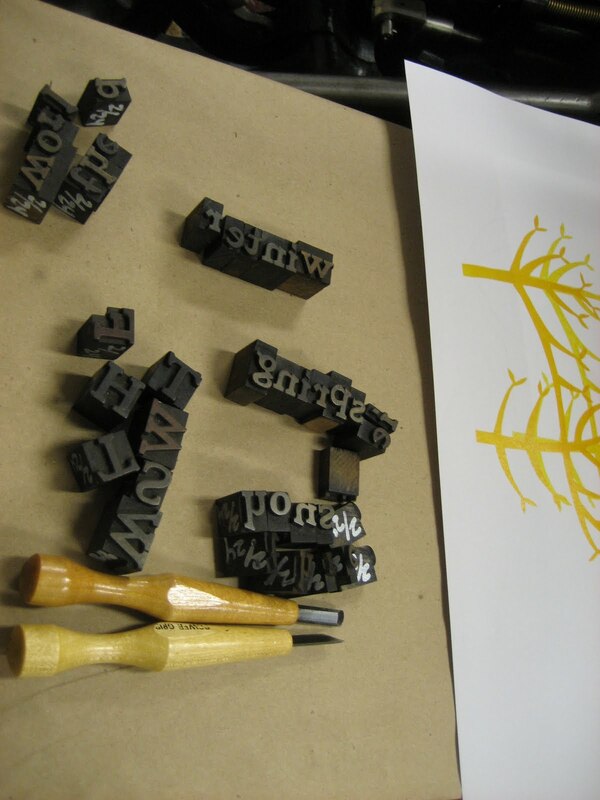 Setting type for the colophon. One of the reduction woodblocks used to print the imagery for "Three, 2001". 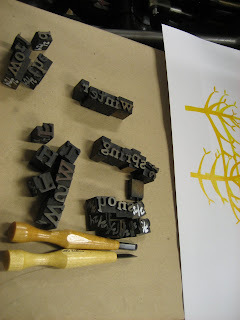 Woodtype used for printing the titles on the covers. I printed and bound these works at The Center for Book Arts, in New York City, during my residency as the Stein Family Scholar for Advanced Study of Book Arts from the fall of 2010 to the summer of 2011. The images are made up of reduction woodblocks printed on a Charles Brand Etching Press. The type is handset in Spartan Black Condensed 36 pt., Bulletin Typewriter 24 pt., & Remington Typewriter 12 pt., printed on a Vandercook No. 4. I will be posting complete images of the text and interior of this artist books on my website. Five very short stories from 1995, 1999, 2001, 2007, and 2010.